After following Mailgun’s instructions (including the Digital Ocean guide, alternate guide, and community help) I was able to get it setup. If you are setting up your account directly against your domain, then things are a bit easier (and the instructions work a little more as expected). If you are setting up against a subdomain, skim this section as the subdomain instructions are a bit different. I wanted to provide my view of how to get things configured should the shorthand editor in Digital Ocean change between now and when you are reading me. This is what the Zone file looks like to confirm mydomain.com for sending and receiving emails using Mailgun. mydomain.com. 1800 IN NS ns1.digitalocean.com. mydomain.com. 1800 IN NS ns2.digitalocean.com. mydomain.com. 1800 IN NS ns3.digitalocean.com. mydomain.com. 1800 IN MX 10 mxa.mailgun.org. mydomain.com. 1800 IN MX 10 mxb.mailgun.org. email.mydomain.com. 1800 IN CNAME mailgun.org. Please note that 10.20.30.40 is the IP address of your droplet and NOT that provided by mailgun. 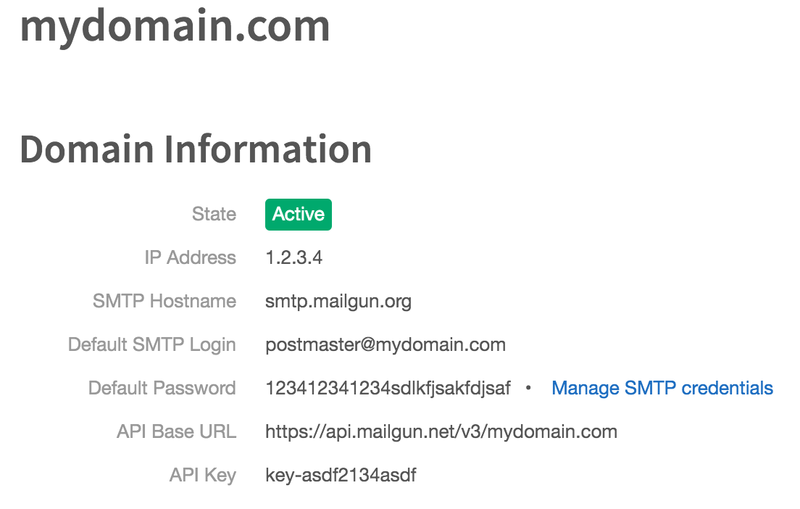 If you want to keep your primary domain free and clear from Mailgun, you might consider setting up a subdomain to route all email through. Please note that in this example I have NOT configured the MX records, and you will not be able to receive emails. This is because at the moment Digital Ocean does not directly support subdomain MX records. 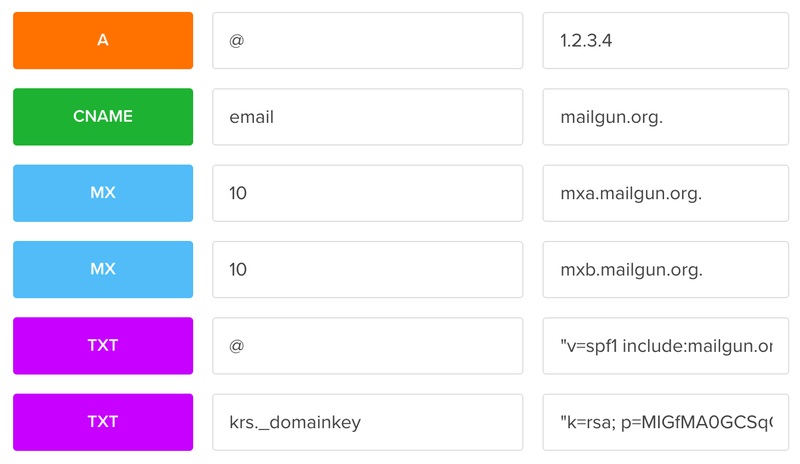 If you do configure your MX records, your account will still show as active, but the MX records will not be configured as you expect in Mailgun. Skip to the next section if you will want to both send AND receive emails from your subdomain. See here and here for discussions about the limitations in the DNS editor. 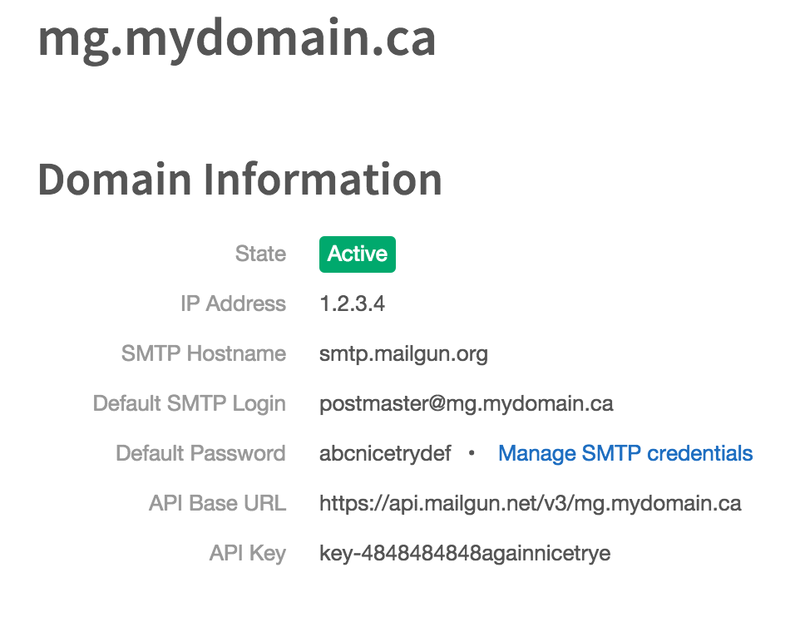 This is what the Zone file looks like to confirm mydomain.ca with a sub domain of mg.mydomain.ca for sending emails using Mailgun. mydomain.ca. 1800 IN NS ns1.digitalocean.com. mydomain.ca. 1800 IN NS ns2.digitalocean.com. mydomain.ca. 1800 IN NS ns3.digitalocean.com. email.mg.mydomain.ca. 1800 IN CNAME mailgun.org. 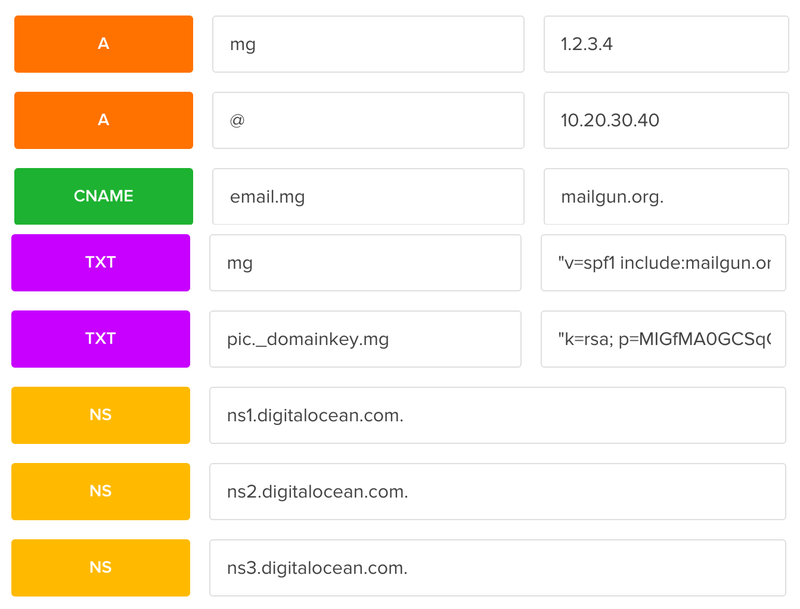 Digital Ocean’s data entry provides shortcuts in the editor, so you will want to leave out mydomain.ca, but NOT mg. Here’s what the values look like in Digital Ocean’s editor. If you wish to receive emails from mg.mydomain.com, then you have a little bit more work to do. The IP address of 1.2.3.4 should that from Mailgun and NOT your droplet’s IP. Here is what the records will look like in editor. 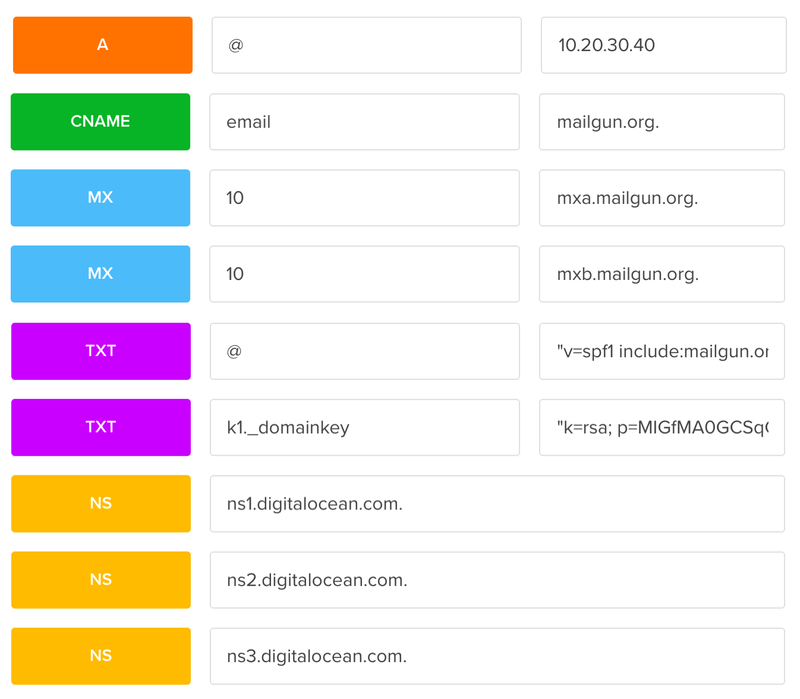 In the above the 1.2.3.4 IP address is the one provided by Mailgun, and NOT your DigitalOcean droplet. Once those settings propagate you should be able to receive emails from @mg.mydomain.com. Do not copy and paste anything from this post, and instead use the values provided by Mailgun.